Inclusions: English or Spanish-speaking tour guides and taxes. Departure Point: Toulouse. Other departure points available. Inquire. This privately guided day tour of Lourdes takes you to Lourdes, the largest Catholic pilgrimage site in France, made famous by a 19th century girl’s visions of the Virgin Mary. 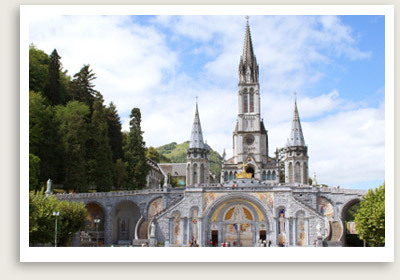 Lourdes consists of a huge complex of sacred sites; you will start your guided tour of Lourdes by visiting the Sanctuary and Grotto of Massbielle, the site of Bernadette’s visions. Pilgrims bathe here in its supposedly healing waters. You will also visit the three churches that were built on site, one on top of the other. After some free time for lunch, your tour guide will take you in Bernadette’s footsteps. Your Lourdes tour guide will show you the family house, where Bernadette’s father ran a mill, and the cachot, a tiny cell where the family lived during harder times. You will have free time in the sanctuary for personal discovery before the drive back to Toulouse.